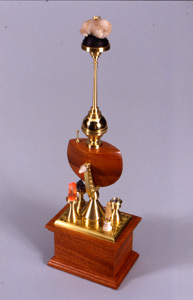 Philosophical Instrument for the lecture on Radiated Energy. Special Features: Radioactive Uranium Agate and Laser Illuminated Quartz Crystal. Materials: Lacquered Honduras Mahogany; Machined Brass, Ebony, Antler, Lodestone, Quartz, Compass. 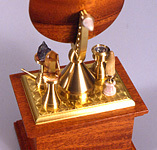 Size: 15.25"h x 4.75"w x 3.5"d.
Detail of Radia Base with Laser Illuminated Crystal, Compass, Lodestone and Antler Tipped Switch. Vesica Radia (my translation: vessel of radiation) again addresses my fascination with the invisibles that surround us. It also came into existence as the result of my pondering a long ago invitation to participate in an anti nuclear weaponry exhibition. It seemed ludicrous to me that we would even have to acknowledge our "anti" status on nuclear devastation. I designed a work for that exhibition that iconized the bomb. We have always feared what we can't see and what is a greater modern fear than things nuclear? I could not resist making a work that was radioactive, something abhorrent to our psyche, when I first discovered Uranium Agate; it was cathartic. Like Uranium (Vaseline) glass marbles, or dinnerware, Uranium Agate glows an eerie lime green when exposed to ultraviolet light. It is magic, a natural magic. If this had been a few centuries earlier I would have believed it was the philosophers stone and I would have been one happy alchemist. For me these objects are all archetypes of wonder. We know what they are, and how they work, but they are still magic. How difficult these object of phenomena must have been for the ancients to explain if they can still mystify us. I can't help but think of the Quartz Crystal as another manifestation of our perception of mysterious forces that surround us. We still search for modern magic that will explain what we cannot perceive. What my students have come to refer to as "Modern Mysticism". Escaping technology, returning to the land, the primal. The original knowledge that they think we had.